i b i k e l o n d o n: One road at a time, London is making cycling progress - and it will change everything! One road at a time, London is making cycling progress - and it will change everything! London has been changing over the summer. Whilst the city was on holiday, Transport for London's contractors have been out in force building bike infrastructure on a remarkable scale. 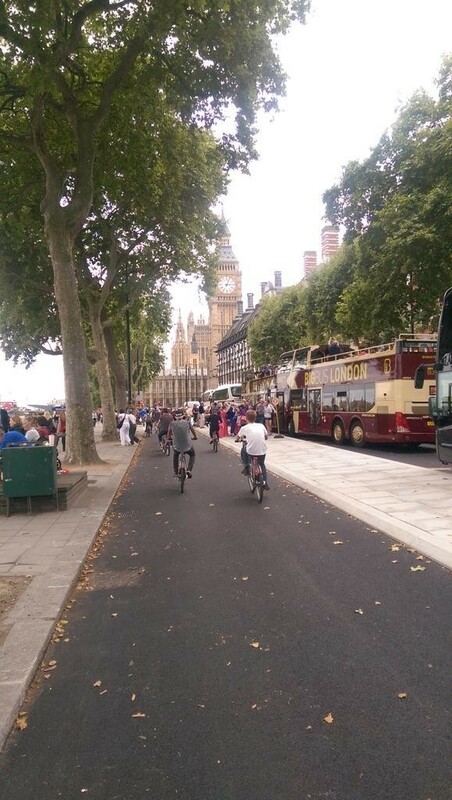 Boris Johnson confirmed he would go ahead with his new Cycle Superhighway plans in January of this year, and now we're seeing the first results on the road. Big construction projects inevitably cause short-term congestion whilst underway, but it is worth remembering the astonishing level of support for the new Cycle Superhighways and the long-term gain they'll bring. The nine-week public consultation on the plans saw an overwhelming 21,500 responses from individuals and business organisations, with 84% in overall support of the plans. A YouGov opinion poll taken during the consultation found 73% of Londoners supported the Cycle Superhighways, even if it meant taking a lane of traffic away. Over 160 major employers, including Deloitte, Coca Cola, Unilever and others came out in support of the East / West Cycle Superhighway which is currently being built on the Embankment. 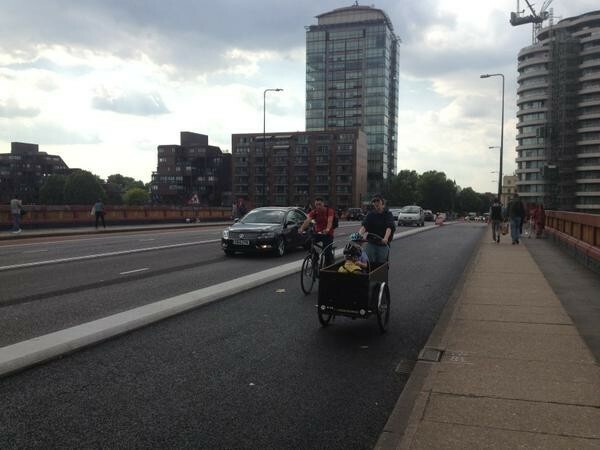 The changes afoot are not just along the route of the East / West Cycle Superhighway. At Oval, CS5 is being upgraded to provide full segregation, including around the terrifying Vauxhall Gyratory and over Vauxhall Bridge. 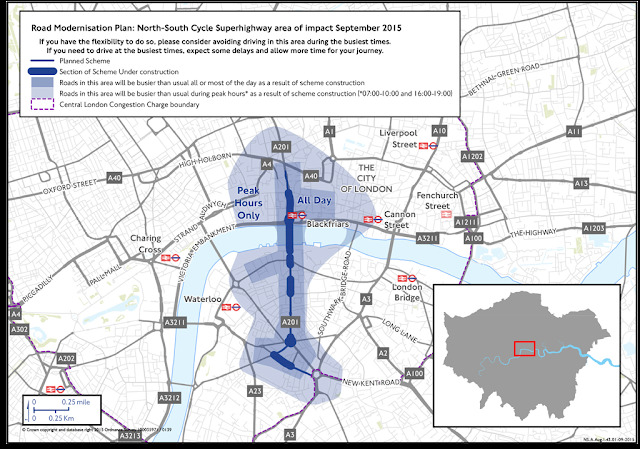 In East London the killer CS2 is also getting an upgrade, with full or semi-segregation being introduced on a route that was previously literally just dirty blue paint and a lot of wishful thinking. Cycle tracks alone can't change a city in to a bike riding paradise. You also need balanced residential zones where local streets are set free from the tyranny of rat running and speeding traffic. 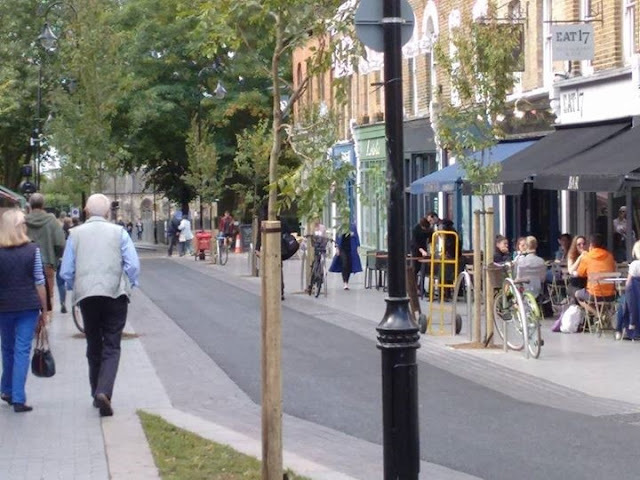 The Waltham Forest Mini Holland is just such a project and is now beginning to take shape - but only because of the diligent work of local residents in the face of vociferous NIMBYs who wish to retain their right to drive 150metres to the local shops... There's a street party on Orford Rd today (Monday) from 3PM to celebrate the completion of the first stage of the project, if you're in the area. But with summer almost over and the city's streets transformed whilst everyone has been away, the pace of change seems unstoppable. The old "blue paint and optimism" superhighways - despite their very obvious limitations - still saw a leap in rider numbers of a minimum of 25%. When these new safe and separated routes open to the public we'll see a torrent, a deluge, a flood of new riders using them, and it's going to change London completely! The site's broken. The pics and texts load for about 300ms then disappear leaving the (horrid) brown background. Hi Izzy, sorry to hear you're having problems - I've checked our system and everything is looking fine. If you have an ad blocker on your software then that might be it, its a known problem with Blogger which unfortunately we users cant do anything about. Of course it is not just public-works construction which leads to road closures in London. You don’t have to walk far in the West End or City to find streets entirely closed, or narrowed to a single lane, for private property construction. Around my office in Shoe Lane, for example, we have had complete road closure for a time and still have road narrowings while a developer overspills onto the road, typically to house plant or site offices. Presumably they have sought agreement from the City of London Corporation for this, so they can build right to the limit of their land boundary and increase the footprint of the building they are developing. On the North-South superhighway, work appears to have started – at least I hope that is what it is as it is making the crossing of Blackfriars Bridge rather more unpleasant than it used to be. The central median south of the bridge outside the Express building, which used to accommodate a NCN route and provide a way for cyclists to get safely to the junction with Stamford Street, is being ripped up now, and the slip off the bridge northbound down to the Embankment is closed for what looks like some fairly radical remodelling. As three of my four accidents involved taxis left-hooking me at that very junction, I would be happy enough for it never to open again! Finally, have you seen the report in the Standard about Upper Street traders up in arms about parking restrictions there? How ironic, that restaurateurs who have (presumably) free use of large areas of the pavement for outside dining are now complaining about moves to take space not from them, but from the vehicles which must surely make that outside dining a less enjoyable experience than it could be. 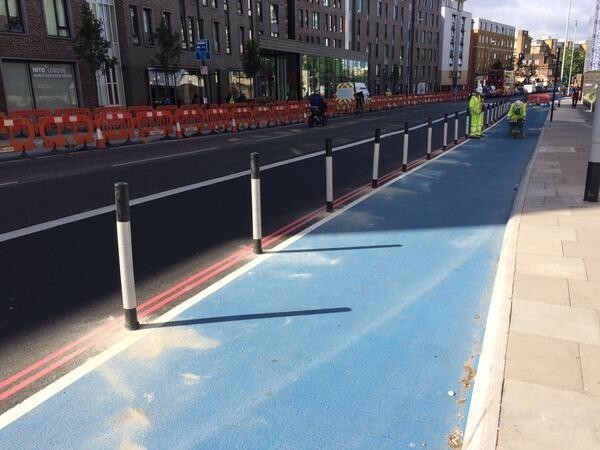 The CS2 photo is Mile End Road. It's outside my university (Queen Mary). It's not very integrated to the canals at this point as you need to turn right to the entrance to university grounds, when coming from north, and the tracks are one way. If you can't view the site with an adblocker enabled I would say the site is broken. This page, curiously, works http://ibikelondon.blogspot.co.uk/2015/07/why-theres-more-to-successful-cycle.html - Mark perhaps you could figure out why and make all your posts work. @Chris Are you having problems with this page too? Apologies, it is a total technical mystery to me. As I mentioned previously, the problems with ad blockers is a Blogger (host) issue which users can't circumvent. V frustrating! I hadn't seen the story about Upper Street but thanks for the tip, I will look it up now. There are similar stories in Waltham Forest Village where today people protesting about the changes the scheme has introduced sat around on cafe tables drinking coffee (whilst having a good whinge), on tables and chairs which are only able to be there because of the changes made by the scheme... I'm starting to think that a change management agent is as important as the designers and engineers with these sorts of things! Cycle smart coaching provides cycling fitness coaching service NZ with effective training program that is tailored to fit the needs of each bike rider taking into account their goals, ability, and other responsibilities. Cycle smart coaching offers great services to group of riders who are looking to train together and helps in achieving their goals. i found lot of benefits of riding my bike, It save time and money, Improve strength and stamina, So I love riding in my free times. Thanks for the nice post. I love cycling, lead a healthy lifestyle, I decided to buy a Mini Bike Pumpe who can help out in a way that is very convenient that the kit includes 4 NOZZLES: Shrader, Tapered Nozzle, Inflation Needle and Prest. SMART, RELIABLE AND HIGHLY EFFICIENT. very interesting i like your blog and the video and content you posted in this post is very informative thanks for sharing.